Dan Amor is a Welsh singer-songwriter. Coming from North Wales, he sings in both English and Welsh, with the album split fairly evenly betwen the two languages. 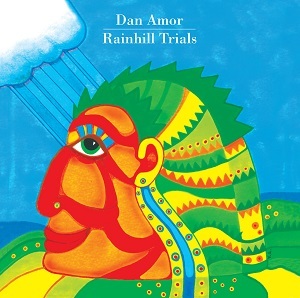 One bit I'm curious about is how he came to call the album "Rainhill trials". For someone who seems to be proud of his Welsh heritage, why name an album after the railway trials at Rainhill (Liverpool), especially since there appears to be no link to any of the songs. It's possible one of the songs in Welsh might give a clue, but not speaking the language means I haven't a clue what he's singing about in the Welsh language songs. Listening to the album, there is a similarity to some of the slower softer Beatles songs from the Abbey Road era. The Beatles feel does come and go - at times there's a really strong Beatles feel but at other times there's no resmblance at all - this is certainly not someone attempting to imitate the Beatles. It's surprising how few artists sing in languages other than English - other than Dan Amor, Cerys Matthews is the only other singer I can think off that sings in Welsh as well as English. Yes it's nice to be able to understand the lyrics of a song, but the success in the UK of Rammstein who only sing in German shows that being able to understand the lyrics isnt essential - if the music is good enough then fans are happy to listen even if they can't understand the lyrics. It's a surprisingly enjoyable album - not the sort of album I'd probably have picked off a shelf to listen to, but once you start to listen it's got a load of great songs, even if half of them have lyrics I can't understand.